While the volunteer patrollers directly serve the visitors and parks; the Trail Users Forum works as a liaison with the county and other users. The Trail Users Forum was originally created in 1995 to facilitate the increased park attendance and different types of trail users. The forum is made up of volunteer citizens from the majority user groups – equestrians, hikers and mountain bikers, as well as Open Space Advisory Committee representatives and Open Space Staff representatives. The purpose of the forum is to take ideas, compliments and concerns from the different user groups and then make recommendations to improve trail use experience for all users to enjoy a safe, quality experience while they also consider the protection of the natural resource. There are eight Equestrian and Hiking Representatives and seven Biking Representatives. The Trail Users Forum improved the horse trailer parking at Centennial Cone as well as implemented the alternating use schedule for hikers and bikers. The schedule is as follows: equestrian use is allowed everyday; weekdays are multi-use and weekends allow bikers on even days and hikers on odd days. This way, equestrians that do not wish to encounter bikes can plan accordingly. In March 2010, the forum implemented changes at Apex Park once it was learned that equestrians had nearly stopped using the trail because the speed of bikers was a safety issue with the horses. Now the park strictly enforces that on odd days, bikes are only allowed to travel one way to allow a safer speed for bikes and horses to interact. 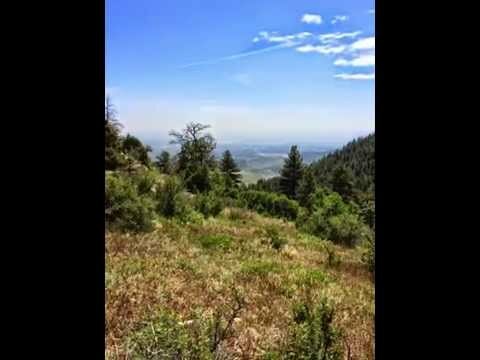 For more information on the Trail Users Forum go to: http://jeffco.us/openspace/openspace_T56_R127.htm. The Trail Users Forum Equestrian Representatives also have a FaceBook page at “Jeffco Colorado Open Space Equestrians”. If there is one thing horse people like to do it is get together and talk about horses. The Buffalo Bill Saddle Club (BBSC) was founded in 1947 by Evergreen and Golden area residents as a way to fellowship and to promote and preserve Western heritage. This doesn’t mean what shape of saddle you use or what type of horse you ride, but just enjoying horses and all that goes with it – caring for livestock, working together, preserving the land and giving the general population the opportunity to enjoy and learn more about horses and their gear. The main way BBSC does this is by creating activities for families and riders of all ages to enjoy their horses and each other. 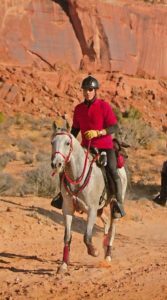 Trail Riding is a big aspect of this along with parades, camping, a gymkhana, social events and monthly meetings. Members participate in only the events that they are interested in and that fit their schedule. 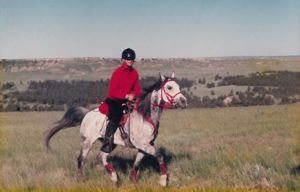 BBSC started with trail rides originating from member homes in Evergreen. They then added three trail rides each year up the Apex Trail originating from Heritage Square and ending at the Buffalo Bill Museum and Grave Site. This evolved into adding Washington Street as part of that ride which turned into the Buffalo Bill Day Parade. In addition to keeping up this tradition, many of today’s rides are in our local parks that are within an hour or two drive of the west metro area. Horse camping with BBSC ranges from primitive tent camping to heading to a ranch like Winding River Resort in Grand Lake with accommodations for both RV’s and those who need a room to stay and even rental horses for themselves or friends and family. 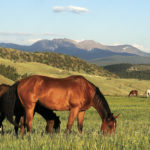 This June, some of the eighty members and their mounts headed up to Custer State Park in South Dakota to stay at a horse friendly campground and enjoy daily rides through the park. This month they went to Beaver Meadows Ranch Resort near Red Feather Lakes in Northern Colorado. Every year they incorporate a breakfast ride, moonlight ride and poker ride. BBSC trail rides are organized for safety and fun. They have thorough guidelines that members follow out of respect and safety of other riders, horses and the land. I met with Jan Kray who started with BBSC in 1998 right after she purchased her horse, Apache. Her first ride with them she had a borrowed saddle and a rented trailer. She was immediately part of the group and felt at home with the diversity of riders, horses and experience levels of both. One member even brought his truck and trailer to where her horse was boarded to help her and her horse become more trailer savvy. Over ten years later and an active member of the group, Jan states, “If you want to have fun with your horse, you want to do it safely and you want to make some nice friends, you like to laugh a lot, come and join us, try us out, come on a ride and see if you like the group.” BBSC also has a Facebook page to facilitate ride sharing and invites to short notice rides by members. 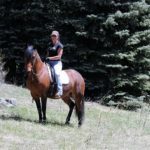 As individuals, some of BBSC’s members are involved as equestrian advocates with the Jefferson County Open Space Trail Use Task Force, which serves to protect the land and acts as a voice between hikers, bikers and equestrians. 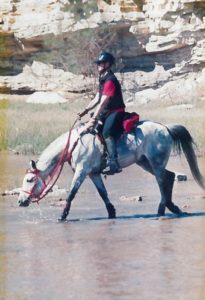 Jan Kray is personally involved with Jefferson County Open Space as a volunteer Equestrian Patroller. To get together, talk horse and just enjoy each other’s company, BBSC members plan gatherings each year such as dinners or attending cultural events. In addition, monthly meetings, consist of planning upcoming rides and events, a time to share information and experiences and many times in the winter months, have horse related outside speakers. In addition, BBSC does a yearly fun family Gymkhana with ribbons, trophies, food and fellowship. As mentioned earlier, BBSC started the Buffalo Bill Days in Golden, which starts each year with a parade and has grown to the largest community festival in Golden, including a car show, golf tournament and Wild West show. Along with participating in the Buffalo Bill Days Parade, BBSC members are regulars at the weekly Golden holiday parades, the Evergreen Rodeo Parade, and the Denver Saint Patrick’s Day Parade – one of the largest “green” parades in our nation. After some of the Golden parades, BBSC members set up corrals and their equipment in Heritage Park to allow the public come to pet the horses, pick up horsey coloring books, ask questions and learn more about our equine companions. Particulars: Go to their website at www.BBSCGolden.org for more information and to view the calendar. Email them at [email protected] Meetings are at Jefferson County Fairgrounds the second Wednesday of the month in the Green Mountain Room B, 7 p.m. Membership fees are $25 per family or $20 per individual. Find them on Facebook for the latest and more communication between members. Copyright 2013 Heather McWilliams. 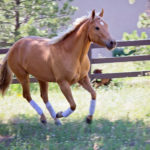 MtnHomes4Horses.com.